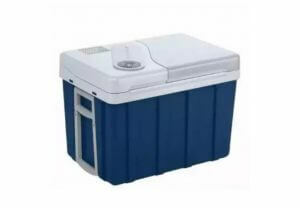 A cooler box is something that plays an important role in camping or outdoor activities. 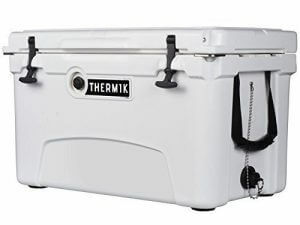 A lot of brands like Coleman, Thermos and Orocan have different types of the cooler from soft, hard, and carry type, with different capacities and materials. There are cute cooler boxes, compact ones, those with very high thermal properties, very cheap ones, and a lot of products with different pros and cons, making it very hard to choose the perfect one. We will explain to you the pointers in choosing a cooler box, with comparing their features, price and reviews and show them to you the most recommended products in rank order. 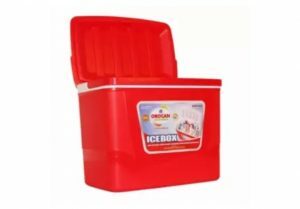 You will surely find the perfect cooler box for you after reading this article! 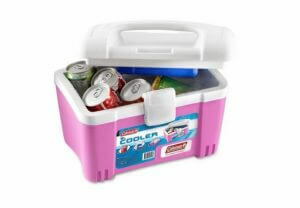 A cooler box is a very important item during camping or barbecue party. For sure there are a lot of people who always wanted to buy one, but can’t choose one because of too many products available in the market. 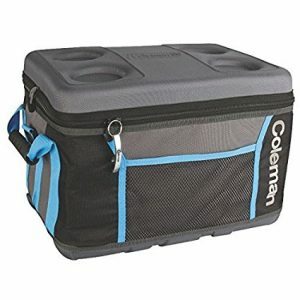 The cooler box that you should buy will depend on “where” you’re going to use it. Please use the below article as your reference in choosing the best cooler box for you. You can hugely categorize cooler boxes into 3 types. Let us look into the differences of each type. This is the most common type, the first type that comes to your mind when you hear the term “cooler box”. Its insulating material is thicker than the soft type, and the lid part where the cool air escapes is made leak-proof, making the hard type the best in keeping things cool. 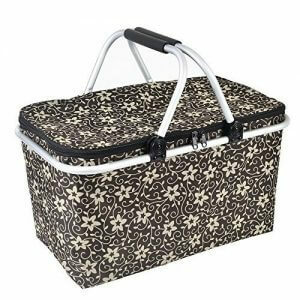 This type is perfect for keeping your food and drinks cold during barbecue parties and camping trips on a hot summer day. Its hard and durable exterior will be perfect too for keeping soft and vulnerable food inside. It can’t be folded compactly, you need to think beforehand the place to store it or where to place it when traveling. 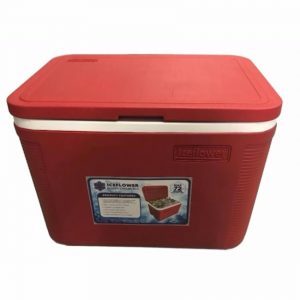 A soft type cooler box is lightweight and easy to bring, and made with a soft material. The best thing about this type is that a lot of products can be folded, and won’t take up too much space when not in use. The effect of the insulator is almost the same with the hard type, though the lid of the soft type is not as leak proof as the hard type, making it easier for the cool air to escape and lowering its ability to keep the cold temperature. It is more versatile and can be used not only during outdoor activities, but also for grocery shopping, etc. It can also be used as a sub-cooler of your hard type cooler box. A hard type cooler with wheels for easier and more convenient traveling. You can put a lot of big and heavy stuff inside, and still move it around with ease. Though if you are going to a campsite with bumpy roads, it might be harder to move them around. It is more recommended for places with flat and smooth flooring/road. 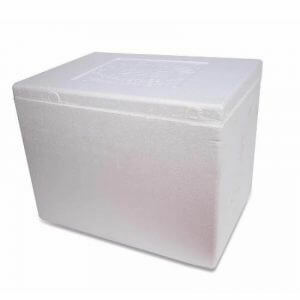 The cooler box’s insulation will hugely depend on the insulator material that is being used. Ideally, we want the material with highest insulation ability, but each material has different durability, price and different pros and cons. Check out the characteristics of each insulator as a reference for choosing the cooler box you will purchase. This is the cheapest and easiest to purchase. It has the lowest insulation, but good enough to keep your food and drinks cool, and thicker styrofoam means higher insulation too. It’s a bit fragile, but is highly recommended to those who do not want to spend too much. The downside of this product is that the lid is not completely sealed, and the hot outside air can enter the cooler easily. You can make improvements by putting tape around the lid. This insulator is used by most coolers sold in the market with the most stable insulation. The way it is manufactured made it possible to place insulator in every corner for higher insulation. The thicker the material is, the higher the insulation. A thickness around 6 cm is good enough to achieve an insulation that is as good as a vacuum insulator panel. 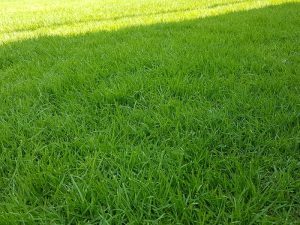 Though if you choose a thicker material, the product itself will become heavier and more expensive, make sure to check it with your budget too. This material has the highest insulation ability among the three materials. The inside of cooler boxes with this material is in a vacuum state, for lower thermal conductivity making the outside heat harder to enter. They are slim with a very high insulation quality, recommended for those who are looking for products with the highest insulation. Though its unique production method is very expensive making the product itself very expensive too. If even one of the panel breaks, the vacuum state will be all gone making it useless so you need to be really careful when using the product. 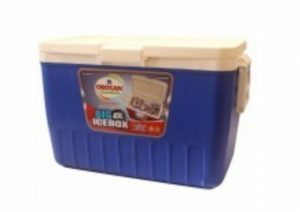 When are you planning to use the cooler box that you are planning to buy? The size you choose is hugely dependent on where you’re going to use it. Let us discuss the perfect usage for each of the capacity. This is the perfect size to keep your lunch box. It can be very useful in your everyday life too, like when you want to keep your drinks cold for a little while. 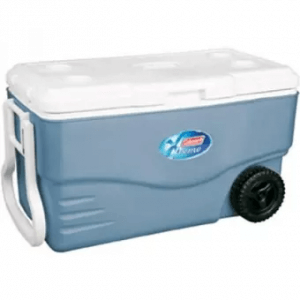 Most of the coolers with this capacity can be folded and stored compactly, and works great as a sub-cooler. You can use it during an outdoor activity, or during your usual grocery shopping. We also recommend leaving this in your car, to use during sudden cooler box needs. This is the best size for a 2 day 1 night camping trip with your family or friends, and the most common size used during barbecue parties. 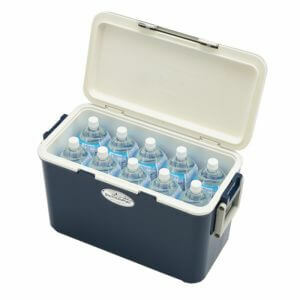 Just add a soft cooler box for your drinks, and you’re all set for almost any outdoor activities. This is the size of most trolley type coolers. Now we will show you the best products available online in rank order! Choosing the cooler box with the perfect size for the perfect occasion will make your camping or barbecue more enjoyable! This product is perfect for those who are looking for a sub-cooler, or those who have maintenance medicines that need to be kept cool during travels. It is very compact and durable with its hard type cooler exterior keeping the content safe and secured. 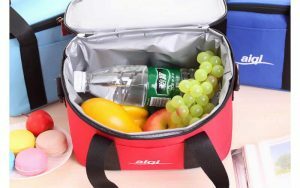 This can also be great for families with children to keep the kids’ food and drinks cold and unspoiled while on the road. Keep Your Food and Drinks in Style! 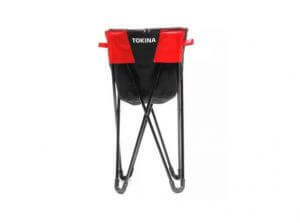 This collapsible product has a capacity of 32 liters and comes with a rubber handle so you can hold it more easily even when loaded with heavy food and drinks. The aluminum frame will keep the content from being deformed and can also prevent beverage spillage. 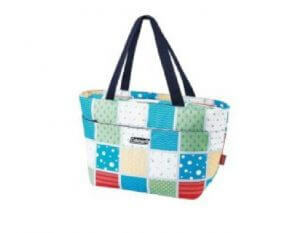 The fashionable design will surely make your picnic or camping trip more fun and stylish. We highly recommend this to those who are looking for a sub-cooler that can be compactly stored when not in use. The best part about this product is that it has two levels that you can use separately. Keep the easily spoiled food at the bottom part and those you need to access frequently at the top part to keep the cold air at the bottom from escaping. A downside of this product is the limited capacity of its upper cooler bag, though we still highly recommend it to breastfeeding moms who want 2 separate compartments for the pump and for the milk. This product has a zipper that also can be used as a bottle opener, perfect for outdoor parties and drinking sessions. The lid also has cup holders that can also work as your mini table. 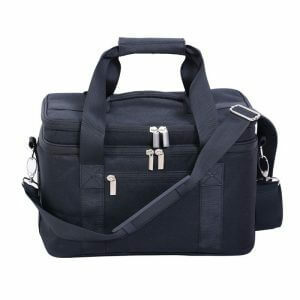 It has a handle on each side so you can have more stability and balance when carrying it, or you can hang it on your shoulders with its detachable shoulder strap. It can be folded flat for compact storage when not in use. 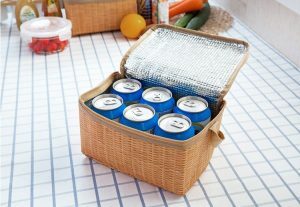 This cooler comes with an aluminum stand to keep it far from the ground, and this stand comes with a case where you can store it and bring it to your out of town trips. It has a small opening at the top, so you won’t have to open the whole lid when getting your drinks, keeping the cold air from escaping as much as possible. This product is perfect for those who are looking for a cooler for their drinks during parties, but can be a bit hard store food because of its unstable sole. Cool, Push, Pull and Sit! 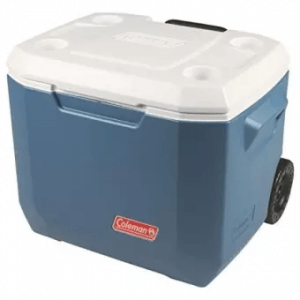 This trolley type cooler box has 5-day ice retention that can be convenient for camping trips that can last for a couple of days, in a faraway land. It has a big capacity that you can bring around easily with its telescoping handle. The price is a bit expensive, but its sturdy design and durability that you can use for years are definitely worth it. A perfect item for those who love outdoor activities! 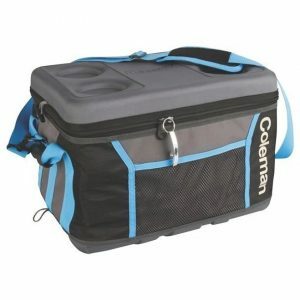 This bag has a thermal insulated cooler at the bottom to keep your food and drinks cool. 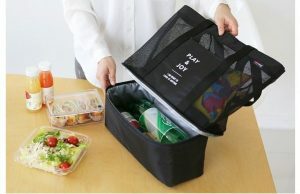 The top part is a mesh bag where you can keep your other food that does not need a cooler. This product will hit 2 stones with 1 bird! It can be a perfect school bag or office bag, where you keep your lunch box in the cooler and your books and notes in the mesh bag part. This product can use the power of electricity to keep its content cool for longer hours, especially after the ice packs have melted. The best part is, it can be plugged into your car’s power outlet so you can use this even in places without electricity, as long as you have your car near you. It has a huge capacity for an electric cooker, with wheels and a handle so you can easily move it around even with heavy contents. 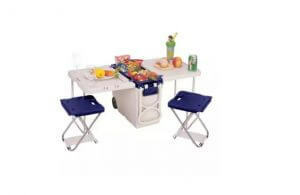 This product comes with built-in tables and chairs that can accommodate up to 2 people. Packing light during outdoor activities will be easier with this! 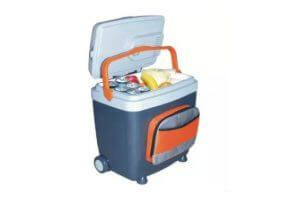 You won’t need to worry about putting in heavy food and drinks because it’s a trolley type cooler with sturdy wheels. It might not be the best product for a group camping, but can be perfect for couples who are looking for a perfect romantic getaway. Cool Food and Drink Faster with Electricity! The best part about this product is that it can cool your food and drinks using electricity. We still recommend using the water flask that comes with this product as ice packs for keeping them cool for longer hours. You can load it with heavy stuff since it has wheels and handle for easier transport. Another unique quality about this product is the soft front pocket that you can use to store utensils, paper plates, condiments, or other stuff you need during an outdoor activity. This is perfect for everyone who wants to pack light on a camping trip. We will explain the proper ways to use cooler boxes. Use them wisely and make your outdoor activity more fun! Make sure to prepare the things you need not only on the day itself but on the day before your actual camping trip or barbecue party. It will result to better insulation, so be sure to check that out. 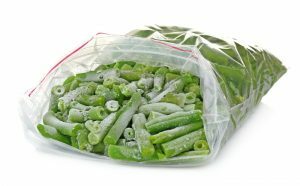 Make sure the ice packs or ice that you will use on the day of the event are frozen. Freezing food or drinks will also serve as ice packs too. Food items that will be eaten on the second day of camping or more will save it from becoming rotten and will also help keep the temperature low at the same time. 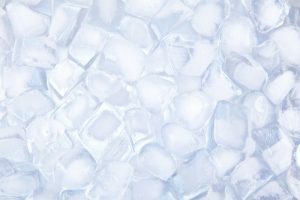 There are ice packs that can be frozen for as cold as -16 degrees Celcius! If you’re not satisfied with the regular ice packs, then we recommend purchasing one of those. One technique in keeping the insulation is to lower the cooler box temperature by putting ice packs or ice on the day before, but make sure you still have ice packs or ice that you need for the next day. Cool your cooler box from the day before, and on the event day itself, try your best to keep the cold air inside the cooler. The way you put your food, drinks and ice packs inside the cooler will affect its insulation greatly. We will explain to you the ways to keep them cold, hope you could use this as a reference! You might think that putting the ice packs and ice on top of your food and drinks will cool your food and drinks faster and keep the cooler temperature low, as the cold air tends to move to a lower area, but this will only result to cold air escaping more easily. To keep the temperature low for a longer time, it is important to make sure the cold air won’t escape. To achieve that, you need to place the ice packs and ice at the bottom part. 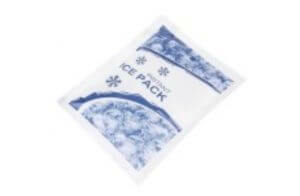 You can prevent spoilage by placing it on top of the ice packs you placed at the bottom of the ice pack. 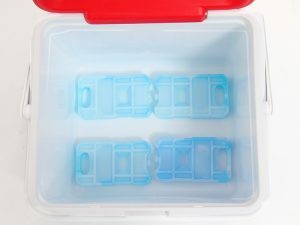 By placing it next to the ice packs, you can also prevent it from touching the hot outside air. Cold air will escape through the empty spaces inside the cooler box. Try to fill in all the spaces while being careful not to deform the food you’re going to put in. 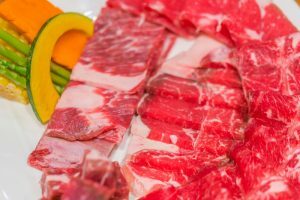 If you can’t avoid the space between your food and the lid, try to fill them in with styrofoams or aluminum sheets to avoid the cold air from escaping. To prevent the cool air from escaping while the lid is open, make sure all the stuff you put in is easier to bring out. It is also effective to use different coolers for different purposes. A few things to keep in mind on the event day for higher insulation. Enjoy a very cold beverage until the last minute of your outdoor activity by using these techniques! The heat from the ground and direct sunlight will weaken the cooler box’s insulation ability. To prevent heat from entering your cooler box, place it under a roof or tree where there is a shade, and prepare a sub table where you can place your cooler box. You can prevent the temperature from rising by placing an aluminum sheet on top of your cooler. The cool air escapes most when you open the lid. Coolers can’t make cool air on its own, so the best way to keep its insulation is to avoid the cool air from escaping. Try not to keep the lid open for too long, and get the stuff you need as fast as you can. The cooler boxes we introduced today are all highly recommended. Hope you can find your favorite item to bring along to your camping and outdoor activities. We hope we were able to help everyone looking for a cooler box!